The Gunslinger: Reloaded online slot is a unique opportunity to enjoy the atmosphere of a real western in the company of six criminals. The main character must stop the uninvited guests through bets in the main mode, in the interactive bonuses and in the accumulative jackpot. 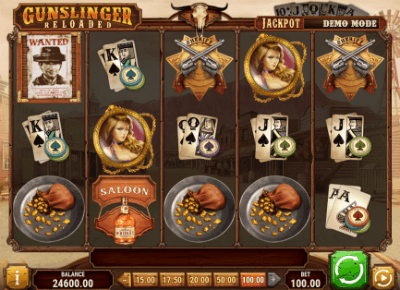 The appearance of the Gunslinger: Reloaded slot machine received the iconic attributes of the Wild West, especially in terms of symbols, which depict robbers, gold, sheriff badges and card values. There is also presented loose Scatter, Wild substitute and “Bounty Hunt / Free spins” activators of bonuses in the collection of online slots in addition to the standard denominations for payouts on the lines. Players should make an effective plan in the process of hunting for a gang of the Gunslinger: Reloaded slot machine. The slot information table, where all the necessary indicators are collected, will help you to determine the successful size of monetary units and the number of spins. The original Gunslinger slot, released a couple of years ago, revived the theme of the Wild West in emulators, adding to the symbolism images of revolvers, bar posters, bottles of whiskey and playing cards, of course. A continuation of the Gunslinger: Reloaded game, which was loved by many players, will be performed in the same style. But it should be noted, that little has changed from the point of view of graphic design. Although visual effects are clearer now. However, they are almost identical to those which can be seen in the original. We are sure, that players will like it. Gunslinger: Reloaded contains 25 fixed paylines, like the original game. Icons are arranged according to the 5x3 scheme. The degree of volatility is medium. The slot also gives players a chance to win a progressive jackpot, which can be 1000x from the bet he made. However, its size can grow. The game can be launched on tablets, smartphones and PC. Speaking about the bonus features, it should be noted, that Gunslinger: Reloaded offers two additional games and a “scatter” symbol. He is represented as a bottle and launches from 10 to 25 free spins and all winnings doubled for the duration of the bonus. Free spins can be restarted and there are no restrictions on the number of repetitions. A poster with the inscription “Wanted Scarters” launches a bonus Bounty and players chase criminals through all the streets of the city during it. 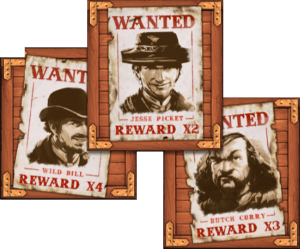 “Bounty Hunt” passes in several stages and each of them increases the number of earned points. The set of characteristics of the Gunslinger: Reloaded slot machine heads accumulative jackpots. Their draw comes after the formation of a straight flush combination on a special indicator of cards. In addition to the main prize, participants can count on consolation rewards with different amounts of money. Probability of winning in “Jackpot” mode depends on the current bet. Multipliers are used in two ways in this online slot. The first one is encountered in the free spins mode, when the x2 multiplier acts on a permanent basis, and the second one is encountered after completing the duel with the burglar during “Bounty Hunt”. The updated slot machine will not leave indifferent fans of the theme of the Wild West. Attractive bonus system, high-quality graphics and an exciting plot wait for players in this novelty.